the sketches came out awesome! i like the difference in color! but more importantly!! I would do anything for one of those bronze figures you have in the picutre. I remember holding one at comic con in NY this year and i was so amazed at how awesome the detail was. they are supposed to resemble the movie turtles no? How could a lingerer like me ever come to own one of these? I can only imagine they must be really REALLY expensive. but thank you very much for sharing the photos with me!! I love the turtles!!!!! -->> .. also like the interesting consistency , systematically the heads look rather similar !! Those statues!!! I had hoped to win the Splinter, but alas, I was not chosen. But they're GORGEOUS!! And they appear to be enjoying the comics. Very cool! I really hope I end up with one of these. the sketches came out awesome! i like the difference in color! but more importantly!! I would do anything for one of those bronze figures you have in the picture. I remember holding one at comic con in NY this year and i was so amazed at how awesome the detail was. they are supposed to resemble the movie turtles no?" Yes. Kevin commissioned their creation years ago -- I think when he was trying to raise money for his "Words and Pictures" museum. They were sculpted specifically to look like the movie Turtles. "How could a lingerer like me ever come to own one of these? I can only imagine they must be really REALLY expensive." Unfortunately, yes. 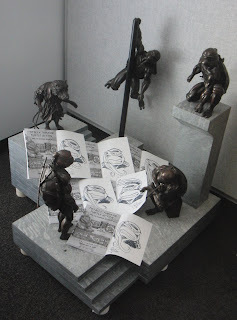 If memory serves, each figure -- if purchased individually -- was $7000, and all five together I think went for $25,000. I bought a few sets to help support the museum, and ended up giving individual ones away to family and friends. I can't recall how many were made, but I think it was a pretty limited edition. -- PL but thank you very much for sharing the photos with me!! I love the turtles!!!! !